People who know me personally, knows that I have a very unique tradition in my own family, started by none other than yours truly. 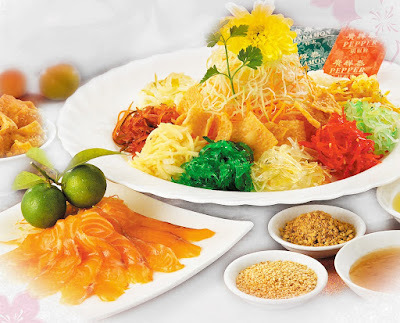 Every year my family will partake in the raising of chopsticks as we indulge in Yu Sheng, or Lo Hei during the Chinese New Year period. 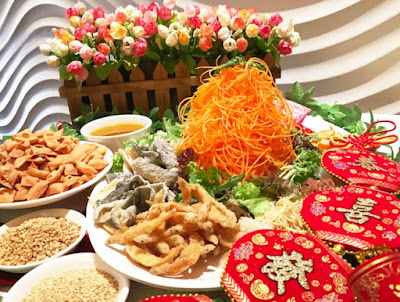 Our family, including the 4 kiddos will have it from the eve till the 15th day of CNY without missing a single day, believing that it brings good luck for the whole family! 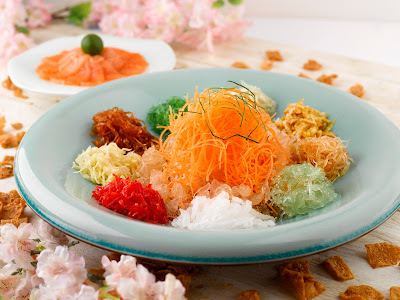 Although the dish was really meant to be consumed on the 7th Day of Chinese New Year Day or what is commonly known as Ren Ri (人日), it was not long before Singaporeans and Malaysians started having it every other day during the festive period! Who would mind having more luck anyway? Reunion Baby Abalone Yu Sheng - A classic rendition of the traditional dish but with fresh baby abalones instead. Salmon option is also available if you would prefer. 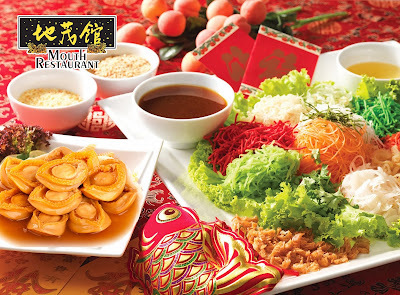 Available for takeaway, order 3 days in advance online here but collection is not available from 28 – 31 Jan 201. Prosperity Smoked Salmon Yu Sheng - Embellishing the traditional delicacy for an extra boost of success and strength are roasted chestnuts, together with twirls of crispy yam, fresh pomelo pulp and white radish that signify luck and longevity. Finally, the dish is finished with a drizzle of Din Tai Fung’s sweet and tangy plum sauce for a refreshing hit! Available from till 11 Feb 2017, for both dine-in and takeaway. Check here for more info. Prosperity Salmon Yu Sheng - Uses fresh Norwegian Salmon with refreshing Yuzu Yu Sheng Sauce drizzled over your usual vegetable strips. Available till 11 Feb 2017, for both dine-in and takeaway. Check website for more info. Kyoaji Yu Sheng - Kyoaji means "taste from Kyoto" and they take pride in serving the freshest seafood. 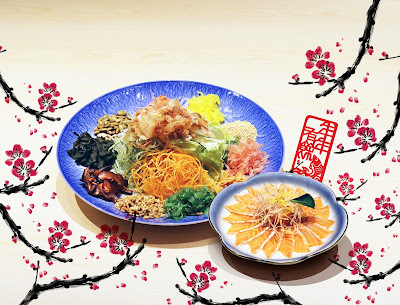 Their Japanese Yu Sheng is a healthier version with sunflower seeds, pumpkin seeds, almond and sesame seeds that adds to the crunchiness, and not forgetting fresh salmon too. Available till 11 Feb 2017, for both dine-in and takeaway. Check website for restaurant info. 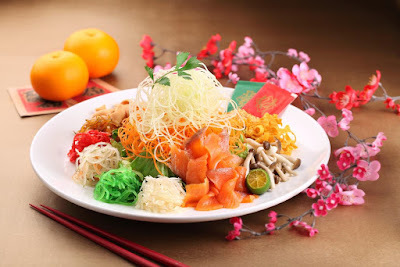 Prosperity Yu Sheng - Another traditional Yu Sheng with the various pickled vegetable and fresh vegetable strips topped with fresh salmon sashimi. Available for both dine-in and takeaway (only GST applies). Check out website for restaurant info. 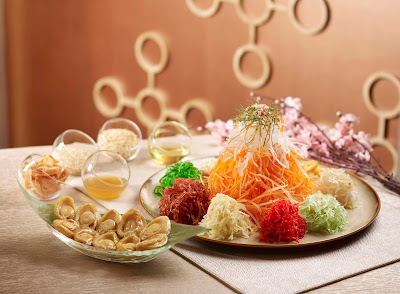 Best know for their fat duck of course, but they do have the traditional Yu Sheng with salmon sashimi too! You will be expecting duck meat right? Available for both dine-in and takeaway ($2+ extra). Check out website for restaurant info. Prosperity Yu Sheng Platter - This platter looks more like a big plate of sashimi rather than your typical Yu Sheng and would surely please any seafood lover with its generous portions of Amberjack, Swordfish, Baby Octopus and Jellyfish! Valid till 12 Feb 2017, for both dine-in and takeaway and delivery with $100 minimum purchase. Check website for info. Fortune 18 Yu Sheng - Consists of 18 auspicious ingredients and thick succulent smoked salmon. 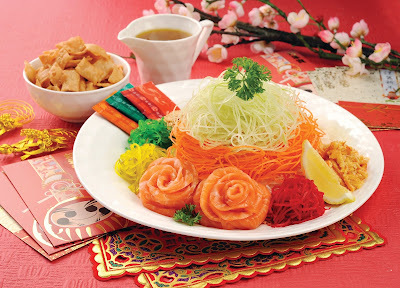 Beside your usual carrot julienne, Chinese lettuce and Chinese celery, this dish also includes ingredients like shimeji mushrooms, sweet pomelo, crispy wanton skins and Swensen’s very own secret recipe sweet and sour plum sauce to inject a refreshing spin of flavours into this classic lunar new year dish. Available till 11 Feb 2017, for both dine-in and takeaway. You can order online here before 07 Feb 2017 for last collection on 11 Feb 2017. Visit any outlets direct for orders after 07 Feb 2017. 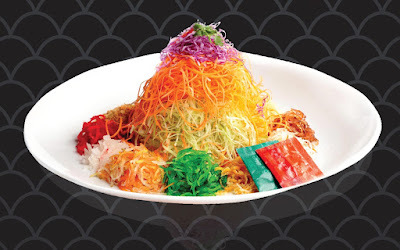 Mouth's Abalone Yu Sheng - Uses Australian baby abalone, olive oil and special home-blended sweet sauce for the oomph! 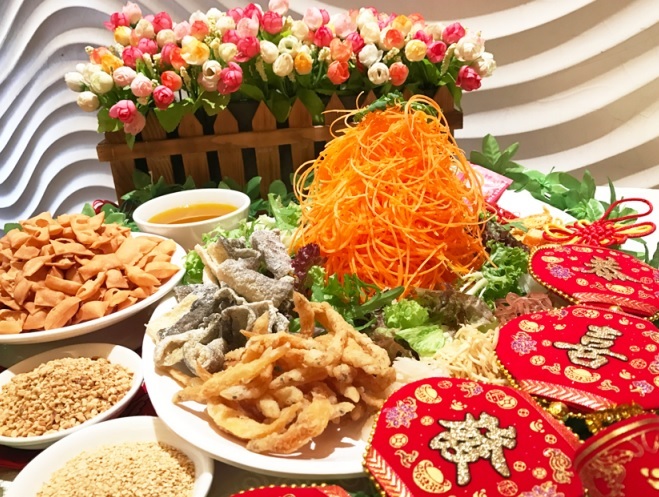 Besides abalone, the restaurant also has a special Duo Fish version that uses Crispy Fish Skin (Dace fish) and Silver Fish (White Bait Fish). Available till 11 Feb 2017. Check out website for restaurant info. 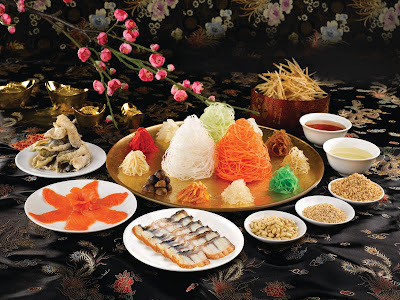 Prosperity Abalone Yu Sheng - A traditional Yu Sheng rendition with strips of cucumber, carrots, radish, paired with tangy condiments and whole abalones which symbolises abundance or surplus of wealth! Available till 12 Feb 2017 and available in one size for takeaways. Check out website for restaurant info. 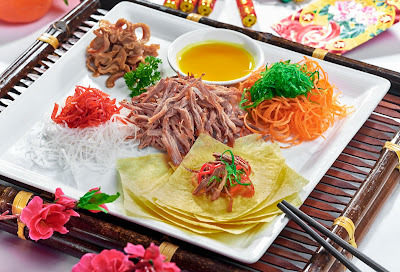 Prosperity Duck Lo Hei - OMG really use duck meat! 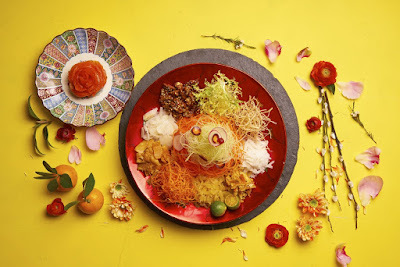 A modern take on the traditional Yu Sheng (Lo Hei), this dish features their signature roasted duck shredded and mixed with a variety of meat and vegetables that gives it a unique fragrance. Other ingredients includes shredded carrot, white radish, preserved melon strips, preserved ginger strips, egg crepes, shredded duck and shredded clam, paired with a special marinade sauce that enhances the dish with its refreshing fruity taste. Only one size available for takeaways. Check out FB page for restaurant info. Prosperity Yu Sheng - Made of luxurious fresh vegetables, mushrooms, homemade yam, sweet potato shreds, and topped with TungLok’s special plum sauce. Do note that fresh Norwegian Salmon is only used for dine-in orders, while smoked Norwegian Salmon will be used for takeaways . Check out website for restaurant info. The true enjoyment of having Lo Hei, is eating it together with your friends and family, and shouting out loud "huat ah!" as you toss the ingredients high up in the air. 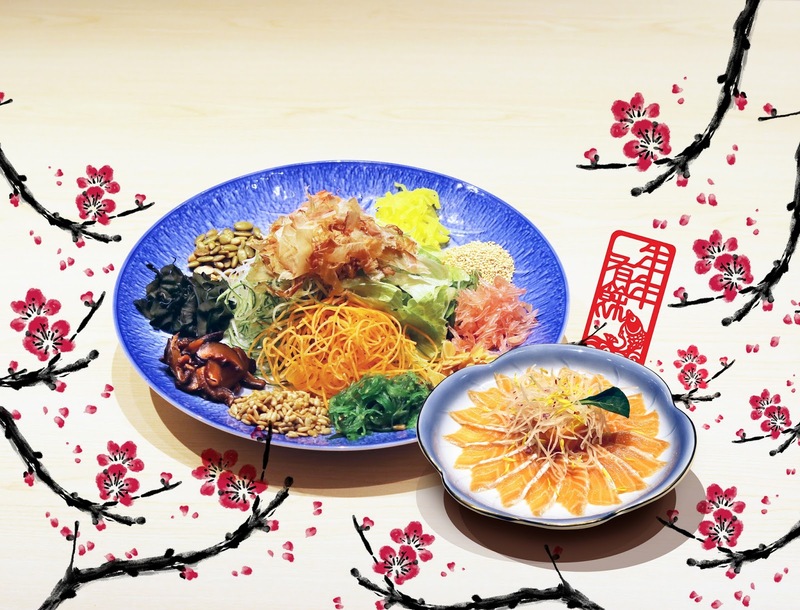 Having delicious Lo Hei would be a bonus! 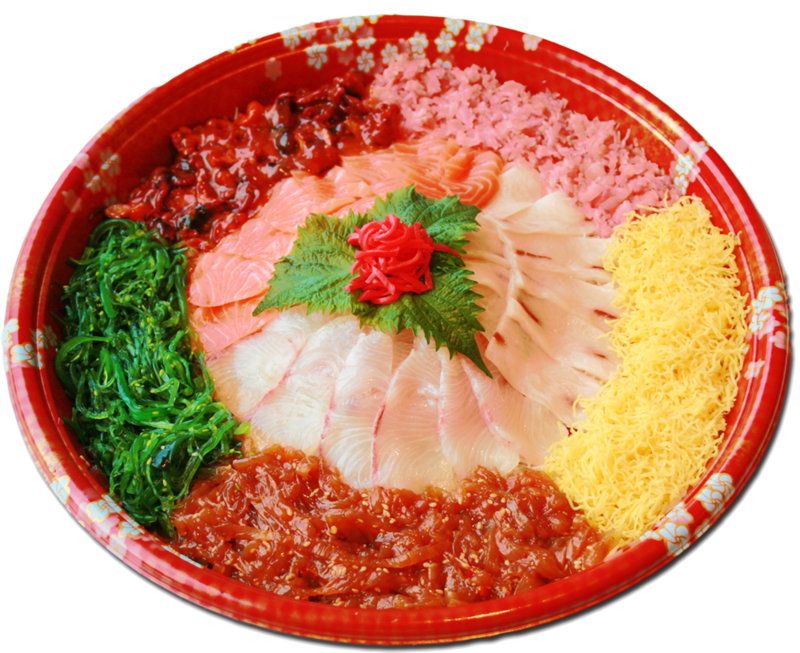 The smiles, the laughter and the positive energy, is what makes everyone lucky, and make this a truly special dish indeed. And with this, I wish everyone and all, a PROSPEROUS and WONDERFUL new year ahead! HUAT AH!